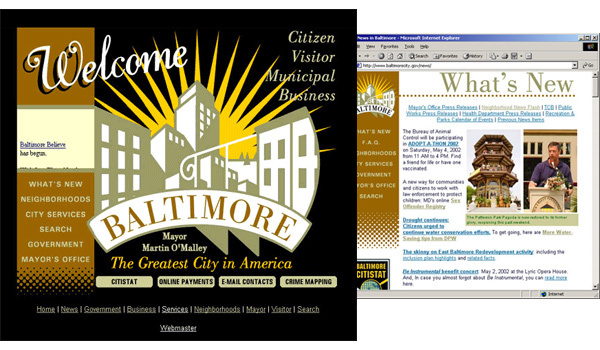 Launched in 2001, BaltimoreCity.gov was the city’s first unified web portal to aggregate all municipal information online. It included cross-departmental directories of city services, neighborhood information, and department officials. The goal in 2001 was easy access to information and unprecedented government transparency. The following year, BaltimoreCity.gov was ranked tops among “Best Local Government Sites” by Governing Magazine and Yahoo! Internet Life.